Tai chi chuan is a spiritual pratice, a martial art and a way to move forward, towards a better life. Open the energy chanels to experience a real state of being in touch with your deep Self . Have the power of choice to transform yourself towards the goals you aspire to. Tai Chi Chuan, meaning, "Supreme Ultimate Boxing", is an internal style of Chinese martial art which focuses on the use of our vital power, or qi. Through slow, relaxed and continuous motion of the body, we improve awareness of the qi flow in the body, strengthening and expanding it to obtain health, martial, and spiritual benefits. As we learn to quiet our thoughts and balance the intention in each of our movements, we gain a valuable ability for its use in our daily life. 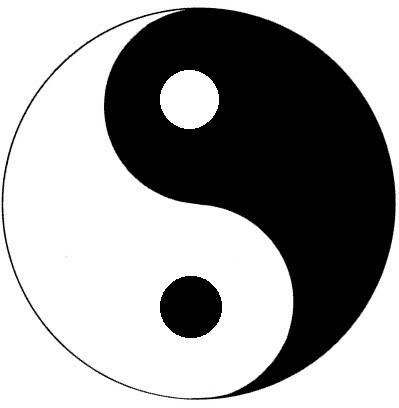 The Yin/ Yang symbol expresses a continuous flow of qi which generates the two opposing forces of positive and negative, darkness and light, heaven and earth, man and woman.... These forces interact to balance each other's excesses and to bring into existence the physical and metaphysical realms. Though poetic, this concept is effectively meaningless unless interpreted according to one's own feelings and experiences. This interpretation is itself a continuous process; our understanding should never become static or final. Whenever we think we grasp something, there is always another level, another aspect or another door. Balance and harmony are visible in nature . According to the legend, Tai chi chuan itself was created by a Taoist monk named Zhang Sanfeng who contemplated a natural event .